The Batangas City Hall. Image source: Google Earth Street View. The City of Batangas was founded as a pueblo by Augustinian missionaries as early as the 16th century, but it became a city as recently as 1969, only the second in the Province of Batangas to be elevated to cityhood after Lipa. Batangas City, of course, is the capital of the entire province and, therefore, the seat of the provincial government. This was not always so; and, in fact, Taal was the seat of government until 1754 when, unfortunately, this pueblo – which was at the time still in what is present-day San Nicolas – was destroyed by the cataclysmic eruption of Taal Volcano. Inhabitants of the town evacuated further away from the lake and closer to Balayan Bay in what would be its location until the present day. 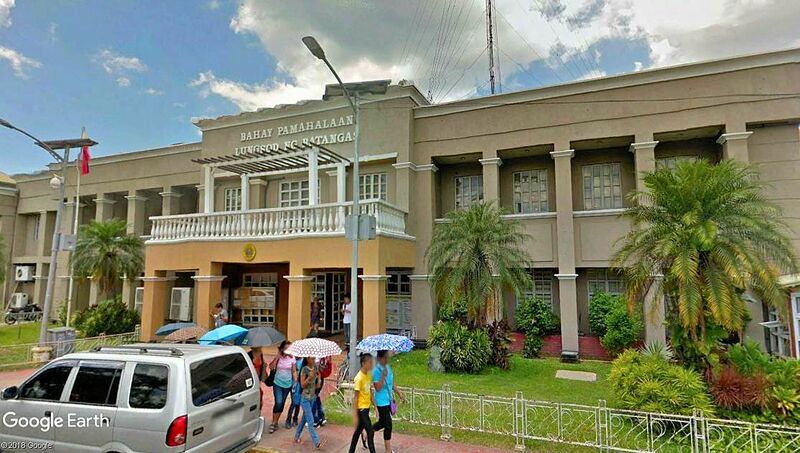 Meanwhile, the seat of government was transferred to the then-town of Batangas and that is where it has been – save for a brief period of time soon after the Japanese invasion in 1942 – ever since. Here is Republic Act Number 5495 which elevated Batangas to the status of city in 1969. Section 1. This Act shall be known as the Charter of Batangas City. Sec. 2. Territory of Batangas City. Batangas City, which is hereby created, shall comprise the present territorial jurisdiction of the Municipality of Batangas in the Province of Batangas. The President of the Philippines may, by executive order, increase the territory of Batangas City by adding thereto such contiguous barrios or municipalities as may be necessary and desirable in the public interest. Sec. 3. Corporate character of the City. Batangas City constitutes a political body corporate and is endowed with the attribute of perpetual succession and possessed of the powers which pertain to a municipal corporation, to be exercised in conformity with the provisions of this Charter. Sec. 4. Seal and general powers of the City. The city shall have a common seal, and may alter the same at pleasure. It may take, purchase, receive, hold, lease, convey, and dispose of real and personal property for the general interests of the city, condemn private property for public use, contract and be contracted with, sue and be sued, prosecute and defend to final judgment and execution suits wherein said city is a party, and exercise all the power hereinafter conferred. Sec. 5. The city not liable for damages. The city shall not be liable for damages or injuries to persons or property arising from failure of the Municipal Board, the Mayor, or any other city officer or employee to enforce the provisions of this Charter, or any other law or ordinance, or from negligence of said Municipal Board, Mayor or city officer or employees while enforcing or attempting to enforce the provisions: Provided, however, That nothing herein contained shall prevent any aggrieved party from filing a personal action in the proper court against any official or employee of the city government for any act or omission in the performance of his duties. Sec. 6. Jurisdiction of the City. The jurisdiction of Batangas City for police purposes shall be co-extensive with its territorial jurisdiction and shall extend to three miles from the shore into Batangas Bay; and for the purpose of protecting and insuring the purity of the water supply of the city, such police jurisdiction shall also extend over all territory within the drainage area of such water supply, or within one hundred meters of any reservoir, conduit, canal, aqueduct or pumping station used in connection with the city water service. The city court shall have concurrent jurisdiction with the municipal courts of the respective municipalities, to try crimes and misdemeanors committed within said drainage area, or within said spaces of one hundred meters. The court first taking jurisdiction of such an offense shall thereafter retain exclusive jurisdiction thereof. The police forces of the several municipalities concerned shall have concurrent jurisdiction with the police force of the city for the maintenance of good order and enforcement of ordinances throughout said zone, area and spaces. But any license that any be issued within said zone, area or space shall be granted by the proper authorities of the municipality concerned, and the fees arising therefrom shall accrue to the treasury of the said municipality, and not that of the city.